I Ching author Nigel Richmond died in 2005, aged 83. He is pictured here in the 1970s, when he wrote 'Language of the Lines'. Two very good books on the I Ching have been out of print for a long time and will not have been seen by many people consulting the Book of Changes today. One, 'Language of the Lines' by Nigel Richmond, was published in 1977 by Wildwood House and has never been reprinted; the other, also by Richmond, is 'The I Ching Oracle', an A4 comb-bound book published by the author himself in 1985. Two further editions of the latter work were published, but it was a very small-scale affair and probably no more than a couple of hundred copies in total of all the editions of the second book were ever put into circulation. Download Language of the Lines and The I Ching Oracle in PDF. Nigel Richmond, Nige as he was known to his family and friends, was born August 25, 1921, the third child of Kenneth and Zoë Richmond, who already had two infant daughters and lived in a large house with servants at 15 Devonshire Terrace, near Lancaster Gate, London. Kenneth Richmond was a Jungian psychoanalyst, whose clients included D H Lawrence and Graham Greene. He moved in literary circles, wrote poetry and reviews, was a friend of Walter de la Mare and other well-known writers of the time, cast astrological charts, and was an alcoholic. Zoë was a suffragette and spiritualist medium; she and Kenneth both joined The Society for Psychical Research, in which they played a major role. A fascinating picture of the Richmond household in 1921 is painted by Norman Sherry in 'The Life of Graham Greene, Volume I: 1904–1939' (Penguin, 1989), in the chapter 'Psychoanalysed'. Greene was sent to Kenneth Richmond at the age of 16 after attempting to poison himself. He lived with the Richmonds for six months and received psychoanalysis at eleven o'clock every morning, which mostly consisted of him recounting his dreams while Richmond held a stopwatch to time his associations. Greene wrote in his autobiography 'A Sort of Life' (Bodley Head, 1971) that this period was 'perhaps the happiest six months of my life'. He describes Kenneth Richmond as having 'the appearance of an eccentric musician' and it seems he had a boyhood crush on 'his beautiful wife Zoë', who was 32 at the time. Kenneth Richmond died in 1945 of heart failure at the age of 64, while Zoë lived on till 1986 and the age of 98. At the time of Kenneth's death, he was secretary of The Society for Psychical Research, a post that came with a flat above the Society's offices in Tavistock Square, Bloomsbury, where he died. Both Kenneth and Zoë believed passionately in survival after death: Kenneth wrote a book about psychic experiences entitled 'Evidence of Identity' (London: G Bell & Sons, 1939) and Zoë wrote 'Evidence of Purpose' (G Bell & Sons, 1938), which deals with spontaneous apparitions in dreams and other mediumistic phenomena, based on case files held by the Society. Kenneth had earlier written a novel with the science fiction writer J D Beresford entitled 'W E Ford: A Biography' (London: Collins/New York: George H Doran Company, 1917), which is based on Richmond's own life in the guise of fictional alterego 'William Elphinstone Ford'. He also wrote: 'The Permanent Values in Education' (London: Constable & Co, 1917). Zoë Richmond practised automatic writing, an interest she passed on to Nigel. This may explain an enigmatic statement made on the inside back flyleaf of 'Language of the Lines', where it says that Nigel Richmond 'discovered that half of the existing I Ching was suppressed and missing and that the time was correct for its re-emergence'. There is no explanation of this in the book itself. I never paid much attention to this claim, regarding it as fanciful, but now it seems likely that this 'discovery' was made through automatic writing. Clearly from birth Nigel Richmond was brought up in an environment in which dreams were highly valued, life was thought of as organised and having meaning and purpose, and an interaction between mind and matter was taken for granted. 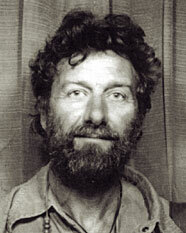 As a young man Nige did experiments attempting to affect matter by the power of the mind, in particular he tried to influence the way the single-celled pond organism Paramecium moved under the microscope, something he describes in a short book he wrote and self-published: 'Now We Are Here: Exploring the edges of our real'. This is an undated work of 119 cut-sheet A5 pages, bound with a plastic clip, blue card cover, and typeset on a word-processor. It was probably published in the late 80s or early 90s in no more than a handful of copies. Nigel Richmond was educated at King Alfred's, a progressive school in Hampstead, north-west London, where he discovered a love of crafts and electronics, and at St James School, Maryland, USA, where he spent a year on a student exchange programme. During World War II he worked at the Admiralty Research Laboratory, Teddington, Middlesex, where he helped to develop radar, and on days off removed unexploded bombs from people's attics. He got married just after the war, in October 1946 in Chelsea, to Cordelia (Cordie) Birnstingl. They had known each other since childhood. Between 1948 and 1955 they had four children, three girls and a boy. 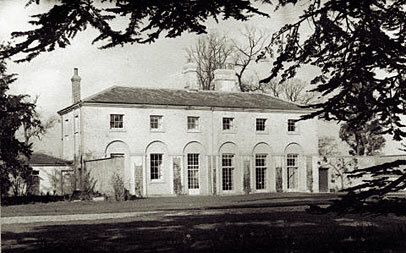 In 1950 Nige and Cordie bought for £4000 the splendid listed building 'The Orangery' (shown above) in Kelvedon, Essex, part of the Felix Hall estate, where Nige set up a small laboratory and worked as a freelance making scientific instruments for use in research projects at the University of London. He wrote his first book here, published in 1961 as 'Christ's Drama: The Nature of Spiritual Growth' (Vincent Stewart Ltd). Just before publication, however, in April 1960, tragedy struck when Cordie died at the young age of 38, as a result of complications from an infection picked up on a trip to Thailand. Nige brought up the four children on his own. He never remarried. He wasn't broody or depressive. His politics were basically liberal, but he had little truck with politicians who he found rather childish and silly. He always voted, but otherwise was not very involved. He mostly liked to talk about the sort of stuff he liked to write about (with me, anyway). He was never into TV much, nor into the arts or music. He was good at doing nothing, at sitting still, when he wasn't working. When he was working he was diligent and conscientious, bit of a perfectionist. When he was ill and couldn't do much physically, we tried to encourage him to get into reading books or watching movies, or doing crosswords, but he just wasn't interested. He never was the kind of person to play games to pass the time (although he used to play tennis socially when we lived in Essex). Maybe a tad puritanical. He was good at showing people how to do/make things. He acquired a reputation as a wise person so people were always asking him things, and I think he got into the habit of being the one who knows; the one who gives rather than the one who receives. Oddly for a writer, he always gave the impression of being a man of few words. He would chat if someone needed him to, otherwise he wouldn't speak unless he had something of value to say. In 1971, when the children had almost grown up, Richmond sold 'The Orangery' for £20,000 and the following year started a commune in a farmhouse with a few acres in Gloucestershire called Hayden Farm. The commune had a changing population of up to a dozen. Marijuana seeds were sown in the hedgerows, bees were kept in hives and the honey collected, and chickens roamed freely about the place. They baked bread, brewed beer, and planted a large vegetable garden. One year they bottled 80lb of tomatoes. They experimented in growing tobacco, but it went mouldy at the curing stage. A tree surgery business sprang up. There was a large workshop where Nige and others did woodturning and carpentry. One year he devised a drill system to attach to the rotovator and planted an acre or so of wheat, from which they made bread. What they couldn't produce themselves was obtained through barter. Some people signed on, one worked as a session musician, local farmers were helped with their haymaking in exchange for needed things. It was a time of great happiness and flourishing, which lasted nearly a decade, though it was blighted in the early days when Nige's eldest daughter Gay was killed in a car crash in 1973. Around this time everyone was into the I Ching and we all had copies of the Richard Wilhelm translation. But Nige got into it more than anyone. He always used yarrow stalks to consult the I Ching, which he collected from the wild himself. He would have extra sets for people who wanted them, too. He preferred sticks to coins as he said the extra time taken made for a better connection, for more focus. In his later years he kept his sticks by his bed and would 'have a chat' with his morning tea. He didn't light incense, he wasn't that formal about it. I think he consulted about anything and everything. As I recall he used his own book and Wilhelm and Blofeld. He would often say in conversation things like 'the Ching says I should wait' or 'the Ching says it'll work out okay, but of course it won't say when!' or 'well, I thought of that, too, but the Ching says it's not a good idea'. He wouldn't go against it. In 1982, after a period of wandering on selling the farm, Richmond settled in Stroud, Gloucestershire, where he made a living as a cabinet maker, working out of a workshop in the basement of his three-storey house. The house was on a hill, the front door to the street being on the middle storey, while the bottom storey opened at the back onto the garden. Here he had a writing room as well as the workshop. He took furniture commissions and came up with ideas for things to make and sell, such as bamboo panpipes and dulcimers. He also experimented with doing I Ching readings for a small fee. He printed up a card bookmark offering consultations in the manner of counselling, a series of sessions rather than a one-off reading. The first session was offered free of charge, but few people took him up on it. It never became a particularly hot iron in the fire, and he carried on making furniture in the main. In 2003 he was diagnosed with prostate cancer, which had already spread to his bones. It was too late for any meaningful treatment, he gradually deteriorated and died on August 13, 2005, a couple of weeks before his 84th birthday. After his death his daughter Beth found a box containing an undated 42-page A4 unpublished typescript entitled 'The teaching of a monkish man', which may be an automatic writing, together with the remaining copies of his self-published poetry books, slim volumes under the titles 'Thirty three' (undated, contains 33 poems), 'Forty' (undated, contains 40 poems), 'Glimpses of the obvious' (1985), 'Pigs and Fishes' (1985), and 'The love of Fu Hsi' (1986). In the latter three – each containing 24 A5 typed pages (folded A4 double-sided photocopies, stapled and trimmed) with a cream card cover – he identifies himself as a 'neo-Taoist' and sees 'the tao' as 'our circumstances'. These works weren't widely distributed, probably no more than a hundred copies of each was printed. 'Forty' and 'Thirty three' look like they were printed on a Gestetner or Roneo stencil duplicator and consist of loose half-foolscap sheets printed one side and secured by a plastic clip at the edge. Richmond also wrote a book of 220 typed A5 pages (laid out two-up on A4 and printed both sides, stapled at the left edge) entitled 'Song on a Mountain', containing poetry with prose commentary interspersed. Only a handful of copies were circulated, more an unpublished typescript than self-published work, though its layout suggests it was prepared for print. This work is also undated, but from its content was written during or after the commune period (the reference to 'a mud valley' in the extract quoted below alludes to the commune). No other writings were found, besides the I Ching books and 'Now We Are Here', that have already been mentioned. Little people like beetles and ants. Bigger people like birds and squirrels. They only come when we allow them to. the song of the mountain clearly. Among Richmond's possessions there was a bundle of letters, from the spring of 1998, to and from six different publishers offering both 'The I Ching Oracle' and 'Now We Are Here' for publication, but no interest was expressed. 'The I Ching Oracle' was self-published in three slightly different editions, the first in 1985, the second in 1987, and the third is undated and may not have been released. I have carefully compared all three and the third edition strikes me as an experiment to include material from his pamphlet 'The love of Fu Hsi' and an attempt to relate the book to his 1977 'Language of the Lines' by changing the main title to 'The I Ching Oracle and the Language of Hexagrams'. A subtitle 'The hexagram language' is also introduced for each hexagram but no new text is added, and there is only a little on this theme in the introduction. This third edition may have been a trial copy for sending to a potential publisher in 1998. … this is because the first looked more outwards to the identified world and this one faces more inwards, so these present readings show the identifications we make in the great reality as less totally real. Remember that everything that is stated is biased in some way; truth is limited without its opposite so it is not possible to speak the tao. In 'Language of the Lines' he says that he is presenting 'the internal oracle' and that 'as it is used our reality is seen from the inside, from the depth' (p 46). In other words, the first work is situated inside looking out and the second book is outside looking in. There is indeed this consistency of viewpoint in both works. Surprisingly, in 'The I Ching Oracle', Richmond doesn't give the hexagrams titles or name-tags, whereas he did in 'Language of the Lines'. Actively he accepts the world like a new morning. So much to be gained! As the tao of repose is marked by this line being the only yang line, here we are involving ourselves in a new phase which is the natural development out of the phase of repose. Being without doubt he gathers friends. If, now that repose is ending, we carry our calm confidence on into activity we can expect the support of others. This shows one major difference between the two works, in the second book he includes and comments on the Chinese imagery. Throughout he gives subtitles to all of the lines according to their position, which follow the same basic form in each hexagram but are varied on the word 'less' or 'more' depending on whether the line is yin changing to yang, or vice-versa. Despite it seeming formulaic, clearly this is putting across a theory of change that he did not address with this level of complexity in the first book. Nigel Richmond's 'Language of the Lines' has sat next to my copy of Wilhelm-Baynes on my bookshelf for 20 years. When I consult the I Ching I take both books off the shelf as one. There used to be a whole shelf of I Ching books there. Two shelves. Now there are only half a dozen books on the subject, the rest having been discarded. Outgrown. But Richmond's work has a quality hard to outgrow.